A lot has changed since I started blogging on January 4, 2005. My first post could have been written today. 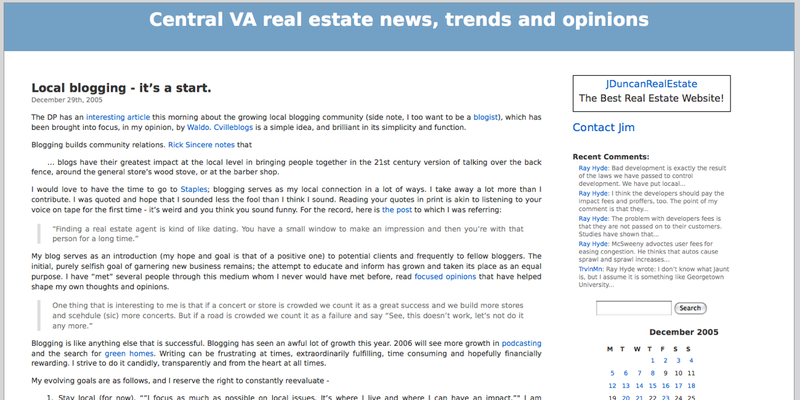 When I started blogging on January 4, 2005 I had no idea that I would be going strong four years later, or how much the real estate blogging medium would have exploded. The impact that real estate blogging has had on the real estate (and the impact yet to be effected) industry is remarkable and incalculable. Over the past four years, I’ve written a lot – at Bloodhound Blog, currently write at Agent Genius, RealCrozetVA since September 2005, recently started RealWaynesboroVA … and have more ideas than time for what I have yet to even begin to accomplish in the blogging space. Even a blog doesn’t provide the space necessary to describe just how much I have learned, or how much I owe to my friends in the real estate blogging world. Or to even begin to describe how much has changed. To the folks in the real estate blogging community with whom we have shared this journey, thank you, thank you, thank you. To my friends and clients I have met through this blog, I am grateful for your time, attention and friendship. I have learned and grown so much from your input on and offline, I will never be able to repay you. While I have deliberately withdrawn a bit from the re.net this year, I remain grateful for the space. I started blogging to fill a void – a void of credible real estate information and analysis about the Charlottesville real estate market. Also, I needed a forum to voice my opinions (I have a lot of them). There are more bloggers today, but few respect real estate blogging as a craft to be perfected; too many see it as “the next best thing” (hint: blogging’s jumped the shark – look to Twitter for the “next” thing). Thanks to the blog, and to my time and expertise, I am now considered an expert in the local real estate market – something that would have been much hard to accomplish as “just a Realtor.” If I didn’t analyze the local real estate market and transparently discuss my analysis and data, I’m not sure I’d be where I am. What I do here is truly a labor of love; even if I got no comments, had no subscribers and no love from Google, I’d still write as often as I do. 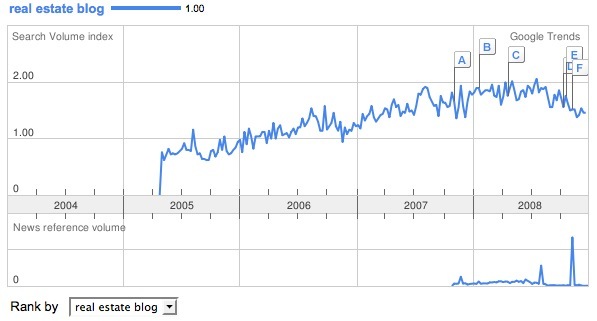 It’s amazing that in June of 2007, we were still being asked whether blogging “gets” clients. Should you blog locally or nationally? The value of transparent blogging is huge. Onward and upward … my goal remains the same – educate myself, buyers, sellers and consumers about the Charlottesville and Central Virginia real estate markets and anything that is tangentially related. Property taxes, eminent domain, transportation, zoning, mold, dual agency, representation … there is always something to write about. I want consumers and Realtors to do what I teach my kids – QUESTION EVERYTHING – motives, data, interpretation, tactics … (of course, I’m in the position where I can simply say – look at my archives to see how my opinion has changed (or not). Trulia and Zillow were birthed. Looking back to early 2007, I remarked about Trulia, “Why is it that they can offer RSS feeds for zip codes, but my MLS cannot?” Now, I can – check out the searches I now have for 22901, 22911, 22932 … offered by Diverse Solutions … yet my MLS still doesn’t offer RSS feeds. I still wonder (and think it may happen) – What if – Zillow is right? 1) Don’t do that. Use WordPress. 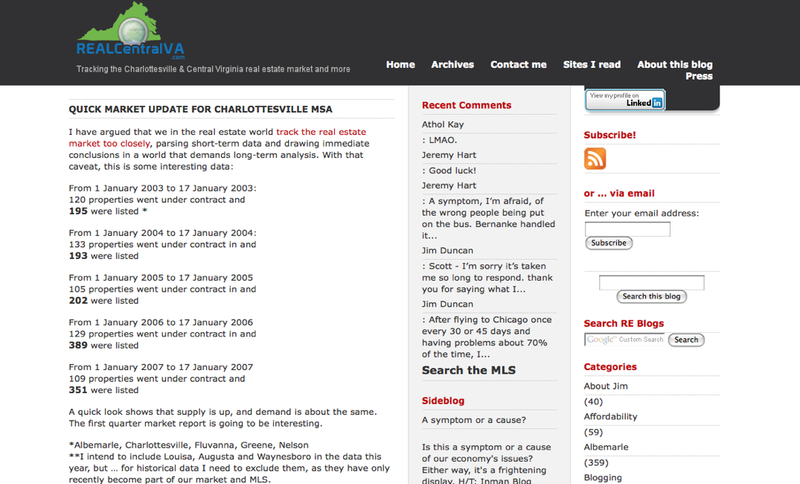 2) It looks like April 10, 2005 was the first time I wrote “CharlAlbemarle” instead of Charlottesville and Albemarle. 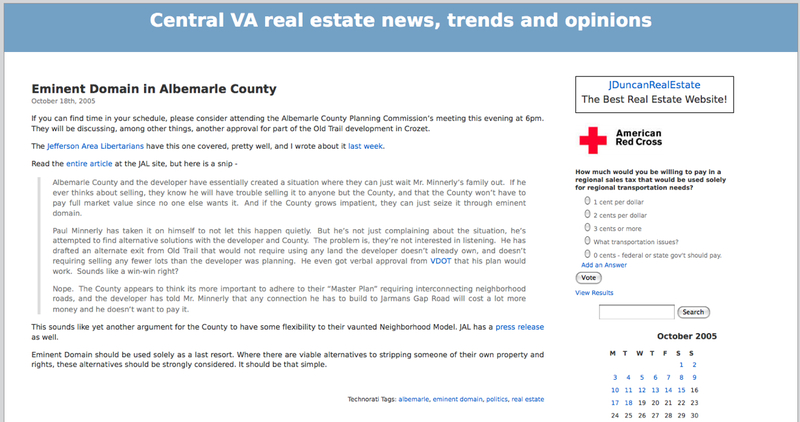 3) I formerly advertised on the Daily Progress‘ website. Looking back at what I used to write about and how I used to write is painful. 1) The thing that sticks out here is that this is the timeframe of Katrina – hence the American Red Cross donation badge in the sidebar. 1) This is the Local blogging – it’s a start post. Sadly I cannot link to the Daily Progress article; their archives are gone. Fortuitously, I saved a PDF. 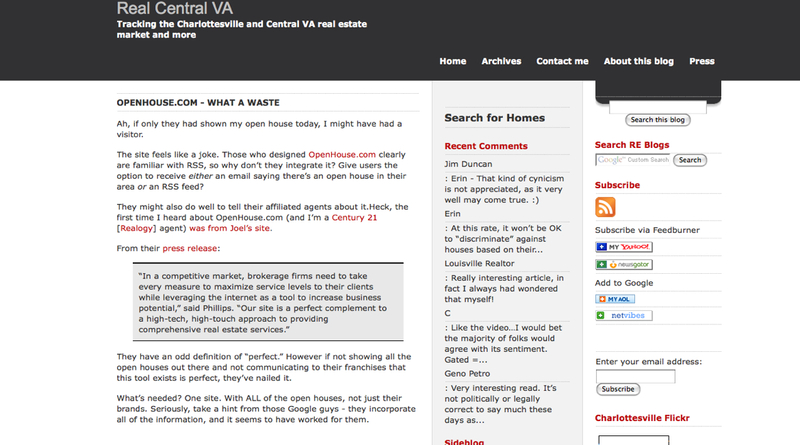 2) The design was the same, and I still had that now-seeming-silly link to “The Best Real Estate Website!” in the sidebar. 2) By this time, I was running the Tiga theme, and it treated me very well for quite a while. 1) I’m digging my new logo, courtesy of Watermark Design in Charlottesville. CNBC cursed this house – it never sold. Congrats on 4 years! You’ve helped lead the way for the rest of us, that’s for sure. Congratulations Jim! That’s quite an achievement. This post came up as a Google alert for “Diverse Solutions” and I wanted to thank you for taking the time to talk to me yesterday about IDX, websites, blogging, etc… You set the bar high for us rookies, and I thank you for that! What a long, strange trip it’s been. Thanks for being there. Congratulations, Jim. That is certainly a great milestone! Over the years we have agreed and disagreed on many issue one thing for sure is that you are tops in the blogging world! You are a model for other local/regional bloggers like me. I’ll keep reading as long as you’re blogging…but I just don’t get Twitter so don’t abandon the blog, please. I’m truly grateful for your friendship; thank you. Charles – I find I learn more through respectful disagreements than I do through talking to the echo chamber. Thanks. Thanks so much for the kind words. The blog will be here, but I absolutely encourage you to test the Twitter waters – I’ve learned a tremendous amount from my friends there. That is an awesome accomplishment. Kudos brother. Well done. As past and future clients we are so glad to have your blog to keep us informed about this market. We have watched a lot of ups and downs, but when the time comes for us to purchase, we feel great that we already have an agent that we can trust, who is so knowledgeable. Congratulations on your milestone! We’ll keep reading.